For STS-114, astronauts will hand off Discovery's new orbital boom between the ISS and shuttle robot arms. Mission managers say the maneuver is required to prevent Discovrey's manipulator arm from striking the ISS. NASA's nextseven astronauts to fly aboard a space shuttle have a bit of orbital hot potatoin store for them when their spacecraft reaches the InternationalSpace Station (ISS) later this year. Using the space shuttle Discovery's robotic arm alongside its ISS counterpart, astronauts with NASA's STS-114mission - the agency's first since the Columbia accident - willperform a meticulously choreographed operation to hand off a new sensor boomand resupply the space station. "We haveflight rules in place that say 'Thou shall not use both robot arms at the sametime,'" said Jeffrey Sugar, a NASA shuttle robotics instructor, in aninterview. "So during the hand-off, it's very clear in the procedure that youhave to get a verbal 'Go' before you can make a move." At the centerof the tricky move is a 50-foot (15-meter) orbital boomtipped with a camera and a laser ranging system designed to help STS-114 astronautsevaluate the integrity of their spacecraft. The boom connects to the end of theDiscovery's robotic arm, just about doubling its reach. While thearm-boom combination will have an ample range of motion in the early days ofthe STS-114's flight, once Discovery docks at the ISS on mission Day 3connecting the two may be a bit more difficult. "Because ofwhere we're docked, and the fact the docking mechanism is in the forward partof our payload bay, you actually can't take the shuttle arm and reach across tograpple the inspection boom without hitting the space station structure," saidSTS-114 mission specialist Wendy Lawrence, who will be operating the ISS armduring the hand-off. "So we're going to space station's arm." Lawrenceand the rest of the STS-114 crew are currently scheduled to launch aboardDiscovery no earlier than May 15. As NASA's first return to flight mission, STS-114 will mark the first test of the orbital boom system, which flight controllers hope will be able to detect any damage toDiscovery's heat-resistant tiles and reinforced carbon carbon(RCC) panels. The STS-114crew is scheduled to rehearse the inspection process and go through the roboticarm motions required for the three spacewalks currently set for the mission. STS-114flight director Paul Hill said that while unusual, using both shuttle and ISSarms for a specific task is not unprecedented. The tworobotic manipulators were a put in simultaneous play previously during NASA's STS-104flight in 2001, when the shuttle Atlantis delivered the U.S.-built airlock andfour high-pressure gas tanks for assembly to the ISS. "While wedon't like it, we understand how to plan for this," Hill said of the double-armoperations. ForSTS-114, Lawrencewill use the ISS arm to pluck the orbital boom from the shuttle payload bay, then hold it up for her fellow astronauts to grab withDiscovery's own arm. Once the shuttle's arm has a good hold, the station'smanipulator will loosen its grip and the Discovery's arm-boomassemblywill be positioned to get a good camera view of docked operations andspacewalks, NASA officials said. "We'regoing to move [the arms] one at a time," Lawrencesaid. "It keeps it simple." 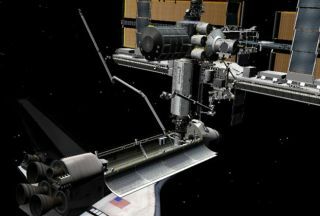 With theorbital boom safely removed from Discovery's payload bay, Lawrence and STS-114 pilot Jim Kelly will usethe ISS manipulator to pull the Raffaello cargo module from the shuttle payload bay andconnect it to the space station for delivery. BeforeDiscovery arrives at the ISS, shuttle astronauts will have already put theorbiter's arm-boom combo through its paces. On Day 2 ofthe spaceflight, mission specialists Andrew Thomas, Charles Camardaand Kelly will maneuver the boom along Discovery's wing leading edges and nosecap to inspect heat tiles and RCC panels. "You've gotto be doing fairly careful, hand-eye coordinated motions at a time when youmight not be at your best," said Thomas, a veteran of tree spaceflights, addingthat shuttle astronauts are often still acclimating to weightlessness on thesecond day of a mission. "What it's all going to be about is clearance monitoring." While theinspection run is automated for the most part, Thomas will have to pre-positionthe boom at the start of every scan and make fine adjustments as needed whilethe sensor package sweeps with two feet of the orbiter's surface at times. Duringeach sensor sweep, Thomas, Camarda and Kelly willscrutinize television camera views to make sure the entire assembly doesn'tstray too close to their spacecraft. "There isno collision avoidance software, so it is up to the operator to make sure theboom doesn't hit the shuttle," Sugar said. Thomas hasalso trained for the possibility that Discovery's orbital boom sensors malfunctionor a repair is needed, requiring a spacewalk in which a crewmember would mountthe end of the boom and make a visual survey of the orbiter. "He's onthe end of a 50-foot arm which is on the end of a 50-foot arm," Thomas said ofthe scenario. "If he pushed with a lot of give, there can be a lot of flexingon the boom....those dynamics you have to worry about." Flightcontrollers are also still analyzing another contingency - the failure of thespace station arm during the hand-off operations, Lawrence said. One potential alternative couldinclude undocking Discovery, pre-positioning the shuttle arm-boom combination, andthen redocking with the ISS, though both the orbiterand station remote manipulators are highly robust systems, she added. "It's arare day that either arm will be completely incapable of accomplishing ourneeds," Lawrencesaid.